Furnished Basement in a beautiful home located in beautiful Pueblo West, CO. Residence is very clean with a lot of space. You will have your own entry, with 2 bedrooms, 1 full bath, plus living room, fireplace and room for entertaining with a refrigerator, sink and microwave. Boats and RV's welcome with electrical hook up. Stable and Corral available if you have horses. 5 minutes from Lake Pueblo State Park. Beautiful mountain views. My wife Mary is originally from the MN area, been in Colorado since 1978. Darrell is a Colorado native, grew up in Alamosa, CO. Navy Veteran, BS Degree from Adams State University and held several positions in the Auto Industry for over 30 years. Mary is retired from United Airlines. Empty nesters with 2 Bernese Mountain Dogs - Bronco and Gracie. Moved to Pueblo West to be closer to family. Both work from home and love the country living life style. 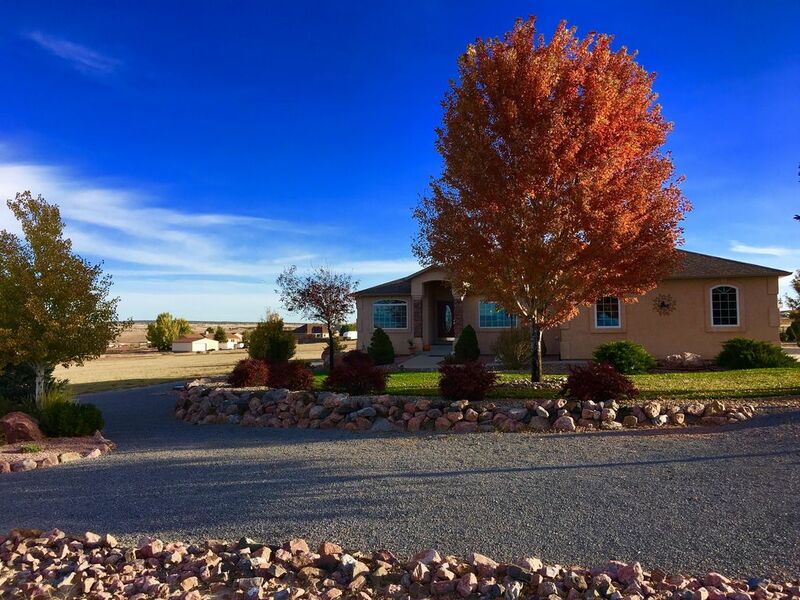 Meticulously maintained one owner rancher, many custom features. Lots of room for entertaining or just relax in the peace and quiet on the covered composite deck while watching the sunset. 2 walk outs to deck, main level master and from living room. 360 views. Basement boasts cozy man cave with wet bar, fireplace, additional bedroom with attached bath and a walkout to beautiful landscaping, 20x30 barn holds 200 bales of hay, 10x10 tack room with concrete floor. Corral has steel pipe fence panels., Backs to miles of bridle paths. Unbelievable mountain views and only 5 minutes from Lake Pueblo State Park. ​​​​​​​​​​​​​​​​​​​​​​​​​​​​​​​​​​​​​​​​​​​​​​​​​​​​​​​​​​​​​​​​​​​​​​​​​​​​​​​​​​​​​​​​​​​​​​​​​​​​​​​​​​​​​​​​Lake Pueblo, rated a fishing “hot spot,” provides over 4,600 surface acres of water, 60 miles of shorelin​​e and almost 10,000 acres of land. Along with the sunny days and a mild year-round climate, visitors quickly learn that one day is not enough. Full service marinas and a diversity of campsites welcome guests to stay awhile. Water recreation includes sailing, motor-boating, waterskiing, river tubing and prime fishing. Boaters choose from two full-service marinas and boat ramps. Not on a dirt road. There is also a convenience store called called Katmando's which includes a general store, liquor store and small restaurant approx 1 mile from our location. Land recreation includes hiking, biking, picnicking and diverse nature exploration. Miles of trails make it easy to discover the beauty of the shady Arkansas River below the dam or the wonder of 200-year-old Juniper trees. Wet or dry activities culminate with camping options that encourage a day of play to become a mini-vacation. Views of the Greenhorn and Wet mountain ranges to the southwest and the magnificent Pikes Peak to the north are a splendid way to end the day. It is no wonder that Lake Pueblo State Park is a favorite destination. Extra towels, linen, blankets, pillows available. Pots and pans, silverware, George Foreman, electric skillet and crock pot. Pub table with three chairs. We also have available: crock pot, George Foreman, electric skillet, pots and pans and silverware. Stable and Corral also available to rent during your stay. A relatively new community, Pueblo West is a covenant-controlled planned housing development. The arid, rising land northwest of Pueblo proper offers views of Pikes Peak to the north and the Spanish Peaks to the south. Pueblo West contains about 26,000 acres of contiguous lands. The community is also situated just north of Lake Pueblo State Park, which contains a lake suitable for boating, swimming, sailing and fishing. Maintained campsites are also available, in addition to miles of hiking and biking trails, including a local greenway that runs all the way to downtown Pueblo. Pueblo West also has a wide variety of outdoor activities. Approximately, 4,600 acres have been reserved for neighborhood parks, playgrounds and an open greenbelt area. Darrell and Mary have a lovely home. The lower level has a separate entry that is very convenient to lots of parking. The wet bar area was very convenient and Darrell stocked it with a few items (bagels and fresh fruit just to mention a few). The space was comfortable with nice touches. It was perfect for our stay! Great place to stay! Everything you need! This is the 2nd time that we've stayed at this property, and we will definitely stay again. Great hospitality, with all the touches of "home". Darrell always responds quickly to reservation requests and any questions we had. We have lots of family in the area, but it's always nice to have our own place to "escape" to relax, sleep, and shower, while visiting for large family functions. =) It's very nice and quiet. My husband loved the large screen TV for football games too. The fireplace was nice, and the fridge had some breakfast beverages, yogurt, and there were some snacks provided as well. Great to know we have this great option for a "home away from home" in Pueblo West. Look forward to staying here again. Thanks Darrell for everything. The home was beautiful and the owners were friendly and accommodating ! There were 4 Adults our stay was wonderful due to the great comforts of home! The beds were comfortable and the couch was very relaxing! Great shower and loved the fireplace it was cozy. Also loved the fact that the owner went out of their way to supply a few breakfast & snack items for us before we even arrived! What a nice surprise after traveling all day! The location for us worked out great you do need a vehicle to get around but that was not a problem. I would highly recommend this place and will stay there again if Im head out towards Pueblo again. Property Overview - Meticulously maintained one owner rancher, many custom features. Lots of room for entertaining or just relax in the peace and quiet on the covered composite deck while watching the sunset. 2 walk outs to deck, main level master and from living room. 360 views. Basement boasts cozy man cave with wet bar, fireplace, additional bedroom with attached bath and a walkout to beautiful landscaping, tons of storage. 20x30 barn holds 200 bales of hay, 10x10 tack room with concrete floor. Corral has steel pipe fence panels., Backs to miles of bridle paths *ADJACENT LOT OVER 1.5 ACRE.